Link to my store to purchase a tree lesson plan at a bargain price! 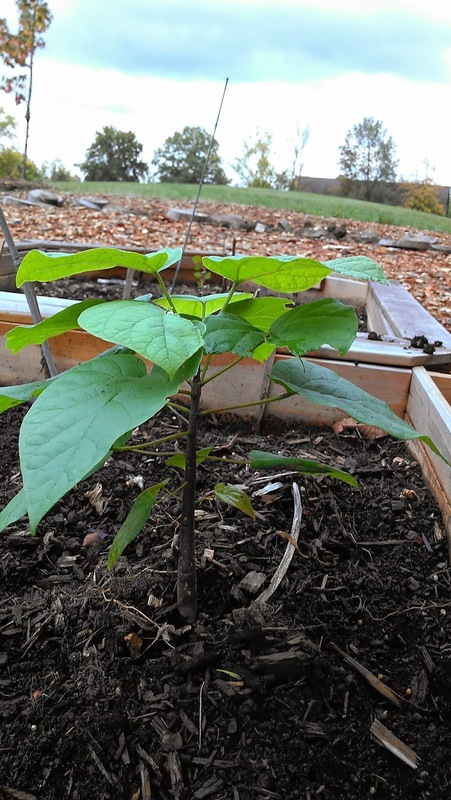 Wonder of wonders, we’ve had some trees sprout at the tree nurseries we started last fall! 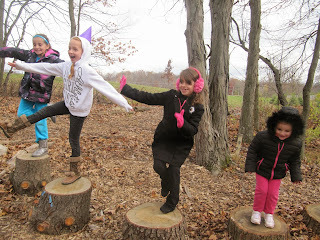 Trees Indiana started tree nurseries at five local elementary schools to supply students with learning experiences about the urban forest. Some schools, such as Huntertown Elementary, Eel River Elementary and Cedar Canyon Elementary started their trees from scratch. That is to say that they planted the trees from seeds. First, the students learned about collecting and stratifying the seeds. 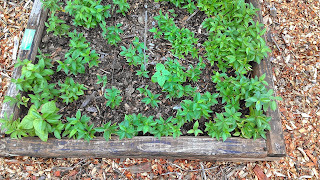 As a group we collected them and then put them in cold frames over the winter. Seeds collected included acorns, maple, ash, catalpa and osage orange. Students learned about the parts of a seed and even dissected some in the fall. 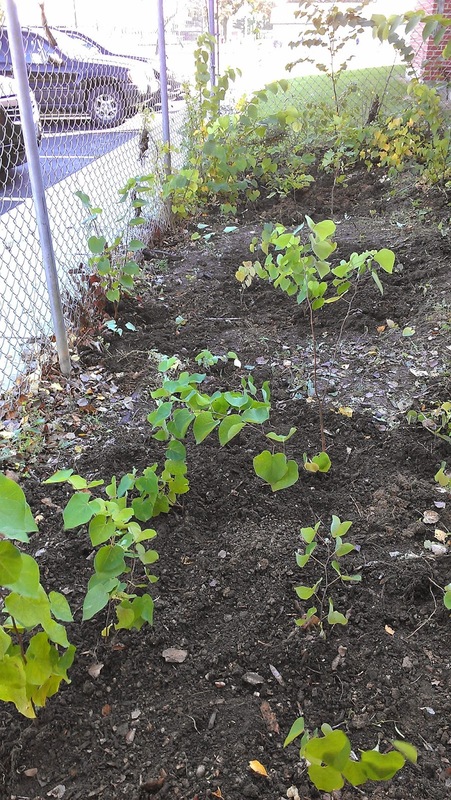 Other schools, such as Towles Montessori and Oak View Elementary planted seedlings which included oak, tulip and redbud trees. These trees all seem to be doing well, although a few were lost over the summer, perhaps due to irregular watering schedules. That is always the tricky part about planting trees at school sites. There aren’t any students around to help in the summer, although the rest of the school year yields wonderful assistance. 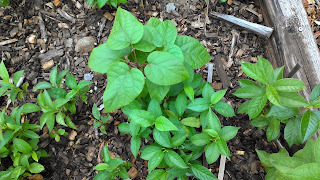 It was very exciting to see tiny trees sprouting from seeds. The best results came from the osage orange trees. Students did an experiment in which seeds were removed from the pulpy (and sticky) fruit and compared with whole fruits and pieces of fruit that were planted. The seeds that came up well were from the whole fruit and fruit pieces. In fact, that was almost the only type of tree that sprouted at the sites. 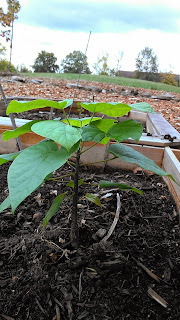 There were two catalpa sprouts and one oak sprout. 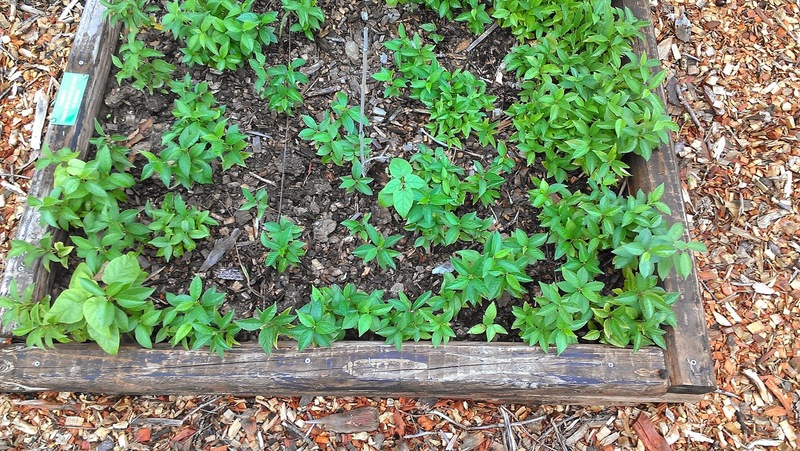 Students will revise methods and replant again this fall. Get outside and go for a walk. You don’t have to have a beautiful, remote natural area nearby to make it a nature walk. The urban forest is everywhere and is defined as any location where there are people, buildings and trees. Look out your window. Yup, you most likely live in a forest…the urban forest. Is there a tree? Then study the base of it or the bark and branches. You are sure to find some wildlife there. No trees? Even a vacant lot has wildlife. Lift up a piece of trash that has been there for a while and you are bound to see something harmless and interesting under it, like a roly-poly bug or an earthworm. This article will describe a variety of things you can do to make any walk a nature hike. It is free and you don’t need any special equipment. Alphabet hike – This is an old favorite, but everyone always enjoys it. Start by trying to spot something with that begins with the letter “A”, like an ant. After you find something that starts with A, move on to B and so on. I sometimes skip the letters I and Z. If a letter is proving to be difficult, then you can allow the use of adjectives. For example, if nothing can be found with the letter V, find something that has a v adjective, like a Very pretty rock. Rainbow hike – This is similar in style to the alphabet hike. Use the colors of the rainbow as your starting point. Remember the old mnemonic device ROY G. BIV to help recall the colors in the rainbow: red, orange, yellow, green, blue, indigo and violet. 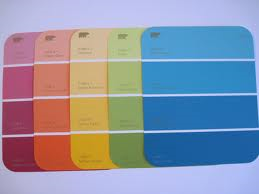 I also sometimes get paint chip color cards from the hardware store and ask children to find something that matches one of the colors on the card. You can have them swap cards as you walk to keep it interesting. Look Under Things- As you walk along, gently lift up things that are on the ground. 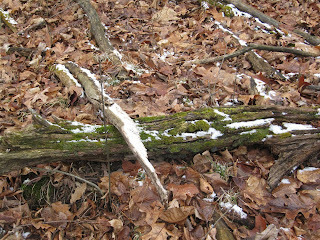 Fallen logs are the best things, because many creatures live in, on and under them. Rocks are also great things to lift up. Just remember, whatever you lift up, you place back exactly as you found it. Also, this is a ‘looking’ activity. Don’t disturb animals or creatures that you find and don’t remove anything, unless you are carefully following the 20 to 1 rule, described below. 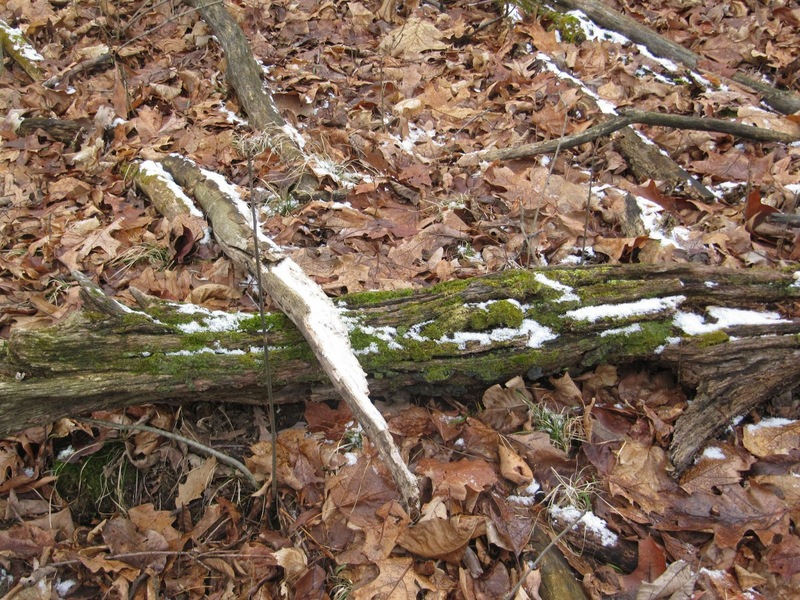 Shades of Green Hike – If it is not winter, this hike works well as a mini-collecting hike. Try to find as many different shades of green as possible by the end of the hike. You may want to bring a little sack along for holding the items you collect. I usually do a group collection rather than each person doing their own individual collection. I often ask children to predict how many different shades we will be able to find. It is fun to see if there were any correct guesses. When collecting for this, model the correct collecting method by following the 20 to 1 rule. That is, if you see 20 of something, you can collect one of it. So, if you see 20 leaves on a twig, you can collect 1 leaf. If there are 40 leaves, then 2 leaves, etc. This goes for any species, plant or animal. 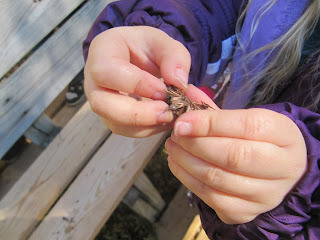 It shows the children how to study nature without harming it. Whenever possible, return the object you collected back to the exact spot from which you gathered it. Counting hike – This one can become a bit tricky as you get towards larger numbers, but by now you get the drift. You will start by spotting one of something. Then you move on to spotting two of the same thing, then three of the something and so on. When you get to really large numbers, don’t forget you can use the number of branches or buds on a tree or pebbles in a pile,etc. Get this book online or from your library. I spy hike – This is the classic I Spy game, just played outdoors. The adult leader can start the game by picking something and saying, “I spy something…” and then give a clue about the object. I sometimes combine this with a game of 20 questions, allowing the children to ask 20 questions about the item I spy. As a bonus, if I have picked something difficult and they figure it out, I sometimes tell them ahead of time that I will do a cartwheel if they guess it. You don’t have to do a cartwheel, but telling them you will do something unexpected if they guess it really improves group participation! 5 senses hike – I like to read the book The Listening Walk by Paul Showers before a hike of this type. Most public libraries have a copy of it. The point of this hike is to get children to use their senses to notice things. Talk about the five senses: hearing, seeing, smelling, touching and tasting before you go. You can pick one to highlight or use all five. I especially like to use the sense of smell, as many children have never stopped to smell a rock or a leaf. Listening is especially good during the winter, as sound travels well through leafless trees. Be careful and consult an expert if you decide to use the sense of taste on your walk. Simon Says – This one is great if you have a very active group or if you just want your group to be active. Start off with the adult leader saying that the Simon Says hike is all about doing what the leader does and there won’t be any tricks to it to confuse the followers. The leader will walk along normally, then all of the sudden, might say something like “Simon Says hope over this fallen log on one foot”. Do this sporadically throughout the walk to keep them interested and on their toes. You can vary the difficulty of the tasks depending on the age of the children. Boys especially seem to like this sort of hike, especially if they feel they have to stretch their abilities. My all time favorite Simon Says hike involved asking children to jump over a small stream. Most of them didn’t think they could. They all made it! I have taken children on nature walks in the middle of very urban areas. Even while walking with youth through government housing projects, where even the residents think nature doesn’t exist, I have found many living things to fascinate the youngsters. If you suggest to your children that you are going to go on a hike them, they will likely be intrigued, especially if it is not something you generally do together. Children of all ages will enjoy any special effort you make to spend time with them. So, get outside and participate in nature’s best free activity! I’m always game to try a new activity outdoors. Two biggies on my list are paddleboarding and snowshoeing. Today I got to try stand up paddleboarding. It was…different than I expected. Not that it wasn’t a ton of fun, it was just different. I went with a friend to the only place in town that rents stand up paddleboards, heretofore known as SUP. (See, I’m using the lingo already). Fort Wayne Outfitters is full of extremely helpful staff. Several staff members gave us insight as to what route would be good for beginners as well as some tips about the low water level. The SUPs were hauled down to the put in point, which is located on the St. Mary’s River directly in front of the store. It must be mentioned here that the store is really special. It is located inside of the old Cass Street train depot and is beyond quaint. It is also stocked with a nice variety of unique, quality watersport and active apparel. We paddled a few strokes and got ourselves oriented a bit. The best tip for starting out was to look ahead, not down at our feet. Once we did this, we both felt a little bit more relaxed. Right away, my friend glided over something that gave her a jolt because it snagged a bit on the single fin that is on the underside of the SUP. She screamed and we both got a little laugh about it. Seven minutes later, we came to a bridge. We could see some stones under the murky water, so we knew we needed to maneuver around them. However, one of those stones reached up and like the black arm of death, grabbed the fin of my SUP and flung me off of it into the underwater rocks. I went head first into about only two feet of water. I have never been so soaked in so little water. 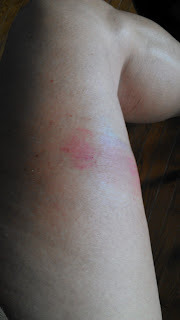 Not to mention that I banged up my right arm and leg pretty badly, as seen in the photo. Nine minutes into the trip and I already had blood streaming down my leg. I kept telling myself that it was nothing, but whenever something happens to me like that and I hit cold water, it makes me feel shaky for about fifteen minutes. While laughing at me, my friend also hit a similar pile of rocks and we were both in the drink. We developed a severe case of the giggles. You know, the kind where you can’t move because you are laughing so hard? We composed ourselves and tried to figure out how to get back on the board without losing our balance. I watched a YouTube video on that very topic right before I left the house, so I knew that you had to start out kneeling, then stand up. Voila—it worked! We paddled down to the confluence of Fort Wayne’s much mentioned three rivers: The Maumee, The St. Mary’s and the St. Joseph. I’ve always wanted to see Fort Wayne from this vantage point, especially since this is near the spot where the original fort stood. It was also our turnaround point. We paddled back to the Fort Wayne Outfitters pier, which was upstream so it was a bit more work. Upon arriving, we had to figure out how to dismount ( just sidle up to the pier and step off, but gently so you don’t push your SUP away and back into the river without you on board). All in all, the trip was a lot of fun. We were gone about 1 ½ hours for a cost of about $25 each. It was a great experience. I might try it again, but at this point, I’d choose my beloved kayak over the SUP. After a hiatus of over a year, natureforall is back on track. Why the hiatus? My day job got a little bit hectic. Things are slowing down now, in fact, maybe too much, which is one more reason I’m resurrecting the blog. The facts below will outline that part of the story. It is a pretty blunt description of my situation, but I feel that sincerity is the only way to go. I work as the Program Director for Trees Indiana, a non-profit organization with a focus on educating youth about the importance of the urban forest. This is accomplished through tree plantings, programs with after school groups, formal education with school districts and informal education with the community at our Nature Explore Classroom. Over the last two years, I have had the pleasure of training 54 teachers in the Urban Forestry Teacher Leader Program. I have worked with over one thousand students. I’ve been busy, which is great. The work I do with Trees Indiana is on a contract basis. This means that every project that comes up, I give Trees Indiana a quote on what it would cost and they decide if they want to go ahead with the program. My work load can be hit and miss. Right now, fund development is in full swing at Trees Indiana, but due to low funds, the organization isn’t able to assign me many projects. While I have complete confidence that this wonderful organization is fully engaged in a capacity building campaign, I still need to make a living. Enter, or re-enter, the natureforall blog. Another system which I’ve become involved with is the online site teacherspayteachers.com. This is a website in which it is possible to purchase teacher created items or to sell such items. Since I have developed a number of unique outdoor lesson plans for teaching science, I have posted some of my lesson plans at this website. Here is a free sample of what I have on teacherspayteachers. Writing this blog will help me fulfill my personal mission, which is to re-connect youth with nature. It will also help my bottom line. This is the only time I will post specifically to tell you about the other sites or my career. However, if I have a post that relates to an article or a product, I will put a link to it on this blog. Keep checking back at this site for inspiration to get youth outdoors. Thanks for tuning in!